The Hoover MaxExtract Dual V All Terrain Carpet Washer F7452900 has received consistently high ratings from customers over time. It’s no surprise that a machine of this stature is a crowd pleaser – there are several great features. For starters, it can be used on both carpet and hard floor surfaces in your home, and uses a combination of technologies to efficiently both clean and dry them. This review will detail all the features of the latest in Hoover carper cleaners, and discuss advantages and disadvantages of owning one. Spin Brushes Technology – Hoover’s patented SpinScrub brushes are what make this carpet deep cleaner such a powerful tool. The brushes are great when used on all surfaces around the home. These little brushes spin in a counter-rotating manner, scrubbing on all sides to gently loosen dirt from all angles. The powerful brushes amazingly do not harm even the most delicate surfaces. Instead, you get a deep clean without all the manual labor, and without worrying about damage. Multiple Brush Speeds – With the latest in spin brush technology, the only thing missing is high-speed clean action. This carpet shampooer comes with all the bells and whistles. The Hoover MaxExtract Dual V All Terrain F7452900PC allows you to alternate amongst gentle spill pick-up, hard floor scrubbing and carpet scrubbing, depending on what surface your cleaning. Hard terrain scrubbing has a slower speed when compared to carpet shampooing. Powerful 12 Amp Motor – The Hoover MaxExtract Dual V All Terrain F7452900PC carpet cleaner has one of the most powerful motors on the market. At an amazing 12 amp capacity, this carpet cleaner will surely get the job done. It has also been stress tested to ensure that it can remain this powerful while cleaning your entire home for years to come. It’s motor power is the highest rated for its class of cleaning machines. Widepath Cleaning – You definitely won’t spend hours shampooing your carpet anymore. This carpet shampooer boasts a wide 13-inch nozzle. This offers about 20% additional cleaning width than regular Hoover SteamVacs, such as the SteamVac with Clean Surge F5914-900. The surprisingly wide surface area of this carpet shampooer enables you to clean surfaces quickly, but evenly and efficiently. Hot Water Cleaning – Users can improve the carpet cleaning experience by using clean hot water for the cleaning process. Although known as a carpet steam cleaner, there is no steamer. The “steam” verbiage can be considered a misnomer – carpet steam cleaners generally do not incorporate an internal heater. It’s the same even for commercial quality machines rented out at supermarkets. That does not mean that the cleaning action is compromised. On the contrary, the feedback from customers regarding the cleaner’s ability to extract dirt has been nothing short of amazing. Separate Clean and Dirty Water Tanks – If you hate mixing clean and dirty, this carpet cleaning machine is perfect for you. The separate clean and dirty water tanks are an added feature to this addition of the Hoover line. You don’t have to change both tanks at the same time, which means you can get back to cleaning more quickly. Each tank has it’s own reservoir for dirty water also, which is easily removed and rinsed. You certainly won’t spend another chunk of your day cleaning you carpet cleaner. Auto Rinse – With the auto rinse feature, this Hoover All Terrain shampooer will clean the carpet or floor with a mixture of water and detergent on the forward stroke, and then rinse the carpet or floor with clean water only on the backward stroke. This means less detergent left on your carpets/floors. Users like this feature because it automatically removes detergent residue, which is safer for children and pets. It can also save time with running another rinse cycle, or money, as less detergent is used. Users can even choose to do more Rinse only cycles if they wish (see next point). Rinse Only Feature – This gives owners the freedom of rinsing out more carpet shampoo detergent, or being able to touch up areas of your home without going through the trouble of shampooing the carpet. Users also have the option of using water only to quickly go over surfaces in your home. Separate Compartment for Detergent – Another related feature of this Hoover carpet cleaner, is that the detergent compartment is kept separate. The machine knows exactly how much detergent to release for cleaning. This saves the user time from having to measure out and manually mix in cleaning detergent. Many users like this features as it can save on the use of detergent. Handtools For Cleaning Upholstery, Couches etc – There’s no hard to reach area that can’t be cleaned with the provided tools of the Hoover MaxExtract Dual V All Terrain Carpet Washer F7452900PC. With your new carpet cleaner, you can expect to find the carpet and upholstery tool, which allows you to clean both carpets and your family’s favorite sitting area. The upholstery tool enables you to maximize the benefits of the cleaning technology to clean couches, stairs, chairs, etc. You will also find the powered SpinScrub hand tool that can be used to clean more difficult areas – like the stairs or shower doors. In addition, the package comes with a squeegee attachment for cleaning hard floors. 8 Foot Hose + Removable Tool Caddy – More about cleaning those hard to reach areas – the eight-foot hose can help you go the distance, and you can take all the tools you need using the tool caddy. This added feature is what makes this machine truly versatile and a good idea for cleaning all over your home. 20 Foot Cord – If you have limited electrical outlets, then you shouldn’t have to worry about running out of cord no matter where you plug this Hoover carpet cleaner. The 20-foot cord gives you more than enough room to move the machine to many areas without running into trouble. Warranty – This Hoover Dual V F7452900PC carpet and hard floor cleaner comes with a one-year warranty, which is pretty standard for these types of machines. If you discover something isn’t quite right with your new Hoover carpet cleaner, you should have plenty of time to get the help you need before the warranty runs out. A lot of users are surprised by all of the dirty water that results from their first use of the Hoover Dual V carpet and floor washer F7452900PC . After using several other brand name machines on a consistent basis, they expected to not have so much dirt left behind, but then the cleaner was still able to pick out more dirt. This carpet cleaner gets the job done, and even cleans up behind others. Many users say they have gotten better results from this machine than from using a commercial grade machine they rented or from professional carpet cleaning services. Besides carpets, the machine works for hardwood floors, ceramic tiled floors or linoleum. The hard floor cleaning can get a bit loud, but most users were happy with the overall cleaning results and looked past it. Compared with the Hoover MaxExtract 77 Deep Cleaner FH50240, there are more positive reviews related to hard floor cleaning experiences from this machine, the MaxExtract Dual V All Terrain F7452900PC. Users enthusiastically describe how the Hoover MaxExtract Dual V All Terrain cleaner was to lift the dirt from their floors and bring back the shine on their floor. Many users are delighted to find that they do not have to spend hours putting their new carpet cleaning machine together. Reviews of this Hoover machine state that the instructions are very easy to follow, and that assembly was complete in no time. Additionally, the machine is very easy to both use and clean. Users are quite pleased with the ability to clean the reservoirs holding dirty water with ease. They complain of this being a hassle with other machines they’ve used. Another popular feature of the Hoover MaxExtract Dual V All Terrain F7452900 is the fast dry time. The heated drying capabilities enable users to dry their surfaces in just about the same amount of time it takes to clean them. This means they are able to clean their carpets just in time for gatherings without the delay of wet carpets. Best carpet/hard floor results – This machine has the best ratings from users regarding the results of cleaning both carpeted and hard floors. It edges out the Hoover Max Extract 77 FH50240 in terms of hard floor cleaning satisfaction ratings. 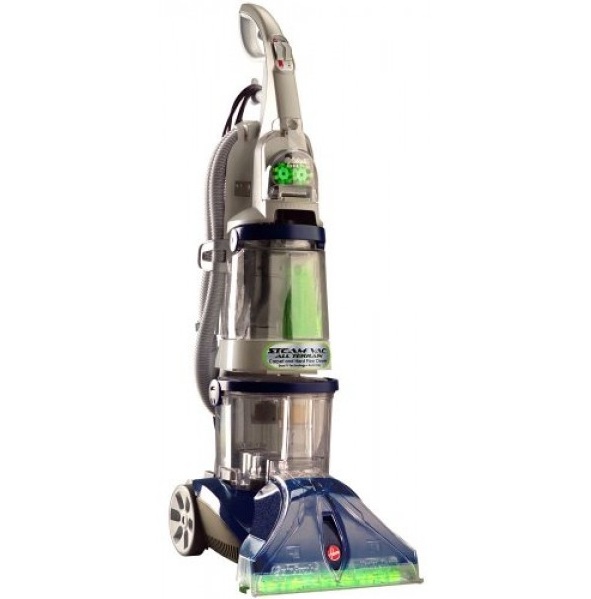 It is also higher rated than the Bissell Big Green Complete Canister Vacuum 7700 carpet and hard floor combo cleaner. Widepath – The Hoover MaxExtract Dual V All Terrain carpet washer F7452900PC offers widepath cleaning. It’s nozzle cleaning path is about 20% wider than Hoover’s other regular full-sized upright cleaners such as the Hoover SteamVac with Clean Surge of Hoover Power Scrub Deluxe Carpet Washer, allowing a wider area to be cleaned with each cleaning stroke. This can save users time and effort. Auto Rinsing – It has the auto rinsing feature, which automatically removes more cleaning shampoo residue from carpets. Auto Rinsing and Rinse mode (see next point) are sought after features, as consumers are getting more and more conscious of the dangers of leaving detergent in carpets. The only other machine with both these features is the Hoover Max Extract 77 FH50240. Separate detergent compartment & Rinse Mode – Detergent is filled through a separate compartment. Users can easily flip a switch to get the machine to clean in Rinse-only mode without detergent. This can save users cleaning detergent. It’s saves the user trouble of mixing their own detergent to water solution, as the machine knows the right ratio of water to cleaning detergent to mix in. Besides this Max Extract Dual V All Terrain Carpet Washer, other models like the Hoover Power Scrub Deluxe and Hoover Max Extract 60 FH50220 and MaxExtract Dual V have this feature. Considered better than Bissell models by some customers – Some users with experience using Bissell machines like this Hoover carpet and floor cleaner better. One user found this All Terrain Dual V cleaner easier to use and is using it to clean a lot more frequently than the Bissell she’s owned for four years. She specifically liked the convenient Hoover dual-tank water system and the brushhead that can be removed and cleaned after use. She also liked how this cleaner included the hard floor squeegee tool, something she had to pay extra for with her Bissell cleaner. Heavy – The Hoover MaxExtract Dual V All Terrain F7452900 cleaner machine is unfortunately the heaviest Hoover carpet cleaner out there. It weighs 30 lbs, which is heavier than most other Hoover cleaners weighing around 20 to 23 lbs. It’s also heavier than most Bissell upright carpet cleaners by a few pounds. Surprisingly, almost no one complained about the weight, even people who have health challenges. Sometimes, the weight of a machine is less of an issue if it is engineered to move easily. After all, the machines stays on the floor and users push it around on wheels. More costly – The Hoover MaxExtract Dual V All Terrain costs more than its counterpart, the MaxExtract Dual V carpet cleaner which does not clean hard floors. Users get the additional benefit of hard floor cleaning with this machine. If you like this machine but don’t only need it for carpet cleaning, consider the MaxExtract Dual V instead. Many users complain that despite the great job it does cleaning, this machine gets loud with hard floor cleaning. Even though the surfaces dry quickly afterward, it is best to plan to clean when no one else will be disturbed by all the noise. Should You Buy The Hoover MaxExtract All Terrain F7452900PC Carpet & Floor Cleaner? The Hoover MaxExtract All Terrain F7452900 carpet and floor cleaner does a remarkable job deep cleaning carpets and hard floors, giving them a new lease of life. It is the best rated combo carpet and hard floor cleaner in the market. More than that, it is easy to assemble and use, and comes complete with tools for cleaning upholstery and even auto interiors. All in all, its excellent cleaning results, versatility and very reasonable price makes it an outstanding choice as a multi-surface floor and carpet cleaner. Ready for clean carpets and floors? Check out the List of Best 5 Machines on the Carpet Cleaning Machines Reviews page.